Dealing with a narcissist can be difficult. Whether they are our partner, parent, child, friend, boss, or co-worker, interacting with them can create feelings within us of shame, low self-worth, frustration, and fatigue. It can be difficult to spot a narcissist until we’re entangled in a dramatic relationship with them. Often, our first interactions with them are positive; they can appear charming, confident, esteemed, and entertaining. But relating with a true narcissist becomes draining, toxic and too much to handle over time. Here are 7 tips to help you recognize and deal with a narcissist. Often exaggerates skills, status, achievements, talents, etc. 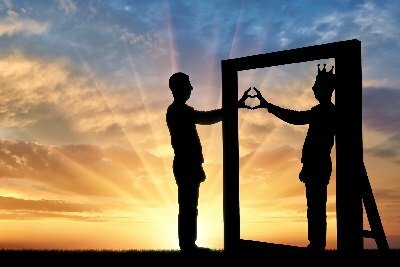 If you have determined that someone may be a narcissist, it is helpful to determine their type of narcissism so you can better understand what you are dealing with. Vulnerable Narcissist: This type typically exhibits behaviors as a mask, or protective mechanism, for coping with a world that feels unsafe to them. It helps to think of their behavior as a type of protective shell that helps them deal with fear of rejection and abandonment. Grandiose Narcissist: This type of narcissist has actually internalized their sense of grandiosity – that is, they believe they are as great as they think they are. In addition, this type of narcissist is often incapable of feeling/showing remorse and has limited capacity for personal introspection. No matter which type of narcissist you are dealing with, it’s important to realize their behavior and mistreatment of others is not about you, although they can often make it seem like it is. It is helpful to look at how they treat others; a narcissist has stable traits from person to person and situation to situation. Their behavior will typically be present no matter who they are interacting with and regardless of the environment. Remember that this is not about you. It is not about something you said, or did, or whether you are valuable enough. It is about their own inner world and you have little, if any effect on them. If you are somehow involved with a narcissist, whether it is your spouse, child, parent, co-worker, boss or someone else with whom interaction is necessary, it is important to set boundaries. The boundaries you set will be up to you to determine, as only you know what you are comfortable with and what you are willing to accept. No matter what boundaries you decide to set up, it is important to stick to them consistently. If you are not sure where to start, it can be helpful to consult a therapist or relationship coach. They can help you identify appropriate boundaries, as well as help you develop an action plan for enforcing those boundaries. Being in a relationship with a narcissist can take its toll on anyone. It is important to remember to take care of yourself. Proper rest, nutrition, boundaries, solid social support, and self-care can help you buffer the negative affects of relating with a narcissist. Again, a therapist or relationship coach can help you identify a plan to take care of yourself and help you stick to it. Some narcissists, particularly those who fall into the vulnerable category, are able to recognize their behavior and consider change. If they decide to seek help, ask how you can be supportive. If they are operating from a place of fear, it can be helpful for them to know they have non-judgmental support from a friend or a loved one. Just remember to take care of your own needs, too. Sometimes, a relationship with a narcissist becomes too draining and jeopardizes our own sense of well-being. If this is the case, and they are not looking to change their behavior, cutting ties with them is not only appropriate, but in some cases, necessary. It is ok to put your needs first, and if your needs include not having to interact with them, know that it is ok to walk away. Please note: If you find yourself in an abusive relationship with a narcissist, and you are concerned for your physical safety, we encourage you to seek help. As with many difficult personalities, dealing with a narcissist can be trying, at best. Know that there is help and you don’t have to navigate this tricky relationship alone. Above all, please remember to take care of yourself.